Curators, researchers, artists, or cultural producers based in the Caribbean region who want to make new links in Scotland and have a keen interest in developing their curatorial practice. Applicants must have a working knowledge of English. Offer practical support for the duration of the research trip in Scotland. This Fellowship opportunity focuses on the development of pragmatic and critical curatorial and artistic practice hailing from the Caribbean region, and is research and practice-led, and mentor-based. The fellow will be invited to Scotland for up to one month from 1 October 2019 to undertake a period of open-ended research and development. Artists or curators may apply to undertake research for a mode of curatorial practice. The Fellowship is focused on alternative forms of Collections and Commissioning, in collaboration with partners across Scotland whose work focuses on various forms of collecting, archiving or supporting the development of artworks. Within the Tilting Axis annual convenings, complexities of mobility, the politics of archiving, access and privilege, decolonisation, institutionalism, curatorial knowledge, pragmatics, and social realities have surfaced as keywords of urgency within Caribbean cultural ecosystems. We seek proposals that engage with the unique visual culture available in the Caribbean and what might be learned from its unexpected and innovative approaches. The Fellowship has an open-ended outcome, offering support for critical development of curatorial or artistic practice while giving a practical base within partner organisations to research different methodologies and institutional approaches. Drawing on the specifics of the Caribbean region through processes of decolonisation, race, mobility, access and privilege and digitalisation, your proposal might approach actively how people live and work, and especially how contemporary art takes a responsibility to reflect and act on it. What are fears as well as potentials in these current times? Within such a complex geography, what are the challenges? What are the interventions? The Fellowship might support and expand these conversations on a mutual basis. More information about each organisation’s core interests can be found below. It is expected that the Fellow will focus on a period of research with each organisation to mutually address some of these questions across the month-long residency. The fellow will receive a fee of £1500 and a per diem to cover expenses and living costs whilst in Scotland. All travel and accommodation costs will be covered by the host partners. An itinerary of travel, meetings and public events will be arranged in collaboration with the successful applicant and partners, prior to the fellow’s arrival. The budget will be managed by the partners, and includes a winter clothing allowances of £300. The Fellow is also expected to participate in a public event or lectures in two or three Scottish locations, to share their knowledge, context and practice. A contribution to the public blogs of British Council and CCA Glasgow as well as the Tilting Axis website will be required along with a final report on the Fellowship. Tilting Axis partners will work towards funding additional funds for the fellow to attend Tilting Axis 6, (location tbc) where the fellow can present on their experience. Applicants for the Fellowship are invited to develop an independent proposal outlining a clear interest in the issues and organisations highlighted. The proposal should be content driven and can be based on already existing research or offer new projects. The fellow is not expected to produce an outcome or finished artwork but will be expected to speak publicly about their ongoing research or interests whilst in Scotland. Departing from a curatorial or artistic ambition, we expect to see a statement of intent of maximum 1000 words. This statement should explain the fellow’s research focus, respond directly to the keywords and thematics raised in the call out, and highlight reasons for visiting Scotland and/or the partner organisations. A separate artist/curatorial statement can also be supplied. Please also include a CV and two references, and an indication of availability from early October 2019. The application should be submitted via e-mail to: Ainslie Roddick, CCA Glasgow Curator: ainslie@cca-glasgow.com. The deadline for submission is 15 April 2019. For more information on the fellowship and the partners, visit the Tilting Axis website here. Our first week at Fresh Milk simultaneously marks our first week in the Caribbean; a region whose artists and writers we have been engaging with from a distance for some time now. We arrived with a mix of anticipation and genuine excitement at the opportunities that lie ahead. We had previously met with Fresh Milk’s director Annalee Davis on her visit to Glasgow for the 2014 Commonwealth Games cultural programme, at the ‘International Artist Initiated’ panel discussion at David Dale Gallery, Glasgow, and had been in dialogue since then. Fresh Milk played a central role in the critical discussions unpacking the commonwealth as a loaded cultural event and its enduring impact for the Caribbean, whilst also representing artist-led activity in Barbados. Our first day at the Fresh Milk residency space took the form of an introduction to the impressive collection within the Colleen Lewis reading room. Annalee talked us through the collection’s categories, and picked out for us seminal texts and exhibitions catalogues which have been helping to give us an overview of not only the current artistic activity and infrastructure in the region, but also the history of artistic practice in Barbados and its ties with elsewhere. We were then introduced to the Fresh Milk Books team. After introducing our practice and discussing a number of our curatorial projects, we started to informally talk with the group about their experience of making work in Barbados, the support the Fresh Milk Books group provides for them, and the manner in which they position their work in relation to specialised interests pursued through this meeting point. The discussion then went off in a number of tangents, from notions of whiteness, skin and beauty ideals, both historically and contemporary. We’re going to be discussing with the group a format for understanding curatorial practice this week, which will lead to a kind of workshop in Week 3, the same week that we will be re-screening our 2012 Afrofuturism artist film and video programme for students at the Barbados Community College. We were also delighted to bring with us a collection of publications generously donated from UK based organisations and individuals, which now call the Colleen Lewis Reading Room their new home. These include Map Magazine; Variant Magazine; Chelsea Space publication archive; University of the Arts London Graduate School; TrAIN Research Centre for Art, Identity and Nation; Flat Time House London; Lyndsay Mann, and Alex Hetherington’s Modern Edinburgh Film School. We hope these publications will be a welcome connection between the UK and Barbados. We also took a trip into the capital of Bridgetown, and later in the week met with a group of local and visiting artists, Fresh Milk friends and the Fresh Milk Books group. 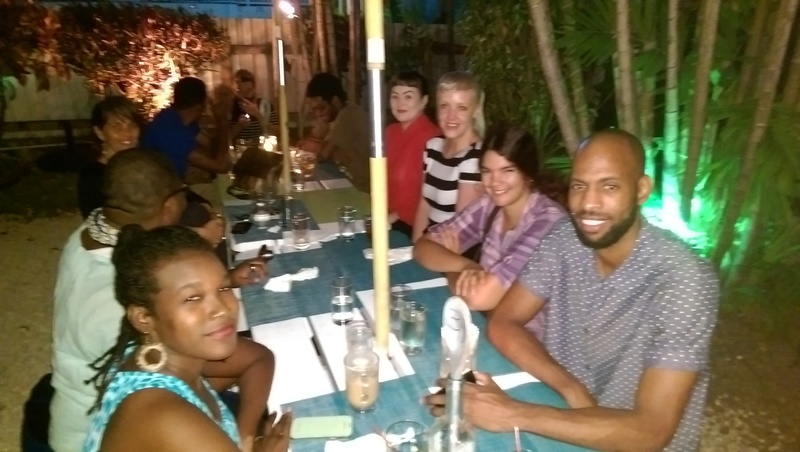 After some rum punches at Mojo’s on the south coast, we had the chance to talk about our practice and our aspirations for the residency, as well as to connect with artists and discuss not only their work but their views on being Bajan practitioners. Among the artists we met was the wonderful Alberta Whittle, whom we have existing connections with from her studies and career in Glasgow. The evening was informal and provided a perfect introduction to the local arts community, before we set up further discussions in the weeks ahead. For now, we are implementing all the planning the first week provided, and will spend our second week mostly outside the studio, meeting with practitioners, and looking towards our return UK project. 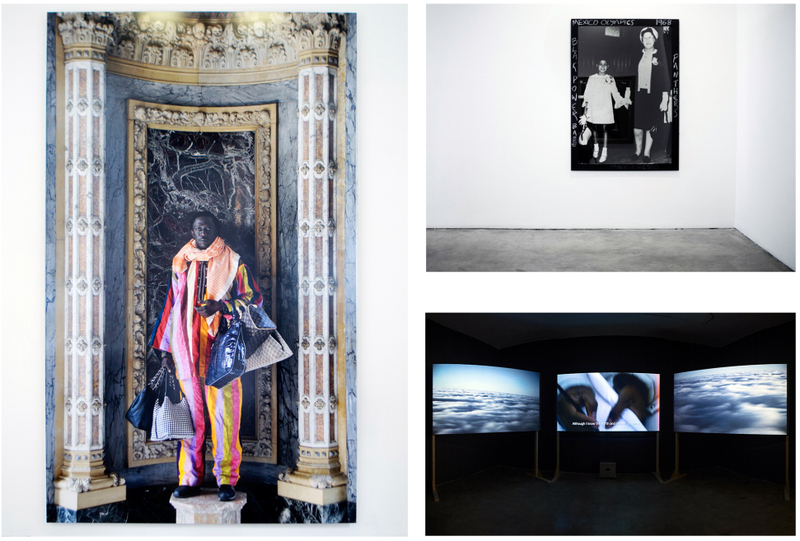 A Thousand of Him, Scattered: Relative Newcomers in Diaspora, Stills: Scotland’s Centre for Photography. Mother Tongue focuses on specific issues that are of ongoing significance for their research into northern Scandinavia and West African cultures. Although they have some knowledge of the Caribbean through the work of writers, diasporic artists and having exhibited work with connections to the region in the past, this exploratory research and writing residency with Fresh Milk will be their first visit to Barbados and the wider Caribbean. During their stay, they will conduct a range of studio visits, archival research, meetings, interviews, etc, as initial groundwork, and as a way of grasping and getting to terms with a locale very different to their home territory of Scotland. Previous residencies undertaken by Mother Tongue have proven to be equally intensive and productive periods of research, which have led to a number of subsequent projects. 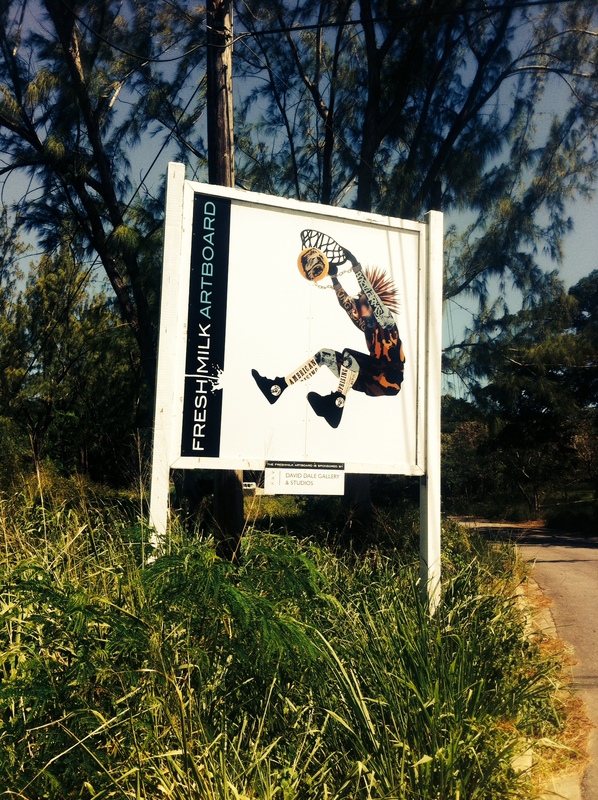 Their time at Fresh Milk will allow for the building of long term links and relationships with artists, writers, thinkers and institutions in Barbados, creating the potential for further collaborations regionally and internationally. Mother Tongue is a research-led curatorial project formed by Tiffany Boyle and Jessica Carden, in response to individual periods of investigation in northern Scandinavia and West Africa. Our practice in exhibition-making intersects with research interests – including, but not limited to – (post)colonialism, language, heritage, ethnicity, whiteness, indigenousness, migration, movement, sexuality, and technology.